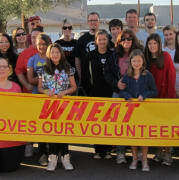 The mission of WHEAT is to educate, advocate, engage and empower individuals to action in the fight against local and global hunger and poverty. WHEAT accepts donations. Donate Now. I am very interested and passionate about WHEATs goals and they overlap with my academic studies in Sustainability. BECAUSE THIS ORGANIZATION CAN HELP ANYONE TO ESTABLISH THEIR GOALS AND OBJECTIONSAND HELP OTHER PEOPLE.